And if you are of the praying sort please add the J family to your prayer list. Their little 2 year old L has been having unexplained seizures lately. They're in the long process of trying to figure out what's causing them. There are certain times I feel overwhelmed with housework (yes, hard to believe, I know). My sister and I sometimes refer to the work we do on those days as housekeeping "give a mouse a cookie" style. You know what I mean. I have to unload the dishwasher so I can clean off the counter. I clean off the counter and realize that I have to throw a bunch of wrappers away. Throwing the wrappers away will remind me to take out the trash. While taking out the trash I will trip over the shoes that need to be put away. Putting away the shoes will prompt me to tidy up the kids' rooms. Then laundry, then tidying up the playroom, then rotating laundry, then organizing the spice rack...they all snowball and you only started out by unloading the dishwasher! Don't pretend you don't know what I'm talking about here! Before you know it you've been working your tail off and have no idea what you've accomplished, but you're sure it was something! Some days I do housework like that. 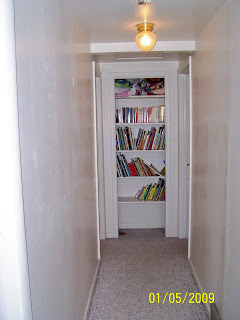 Other days I try to be a little more intentional about finishing a room (easier in my smaller house). This is my more calm way of doing housework. I set a timer for 5, 10 or 15 minutes depending on how motivated I am. (Yes, for you flybabies, this idea is originally from FlyLady, just to give credit where credit is due!) I stay in one room and crank out as much work as I can do in the alloted time. When the timer goes off I move to another room with my timer clipped on my jean's pocket and start there. 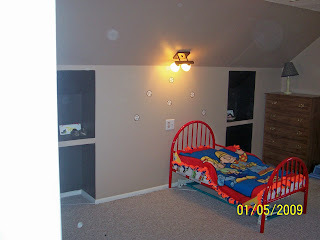 After just that little bit of concentrated time on one room you can stand back and be amazed at what you've accomplished! At this point over 100 other bloggers are sharing what works for them. If my idea doesn't work for you, go over here and see if there is something else that will! The closet in the room we chose to be Avery's had four garments hanging in it when we first looked at the house. There were two little baby sweaters, obviously from an era gone, but not too far gone. Next to them hung two long satin formals. 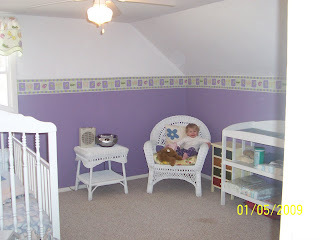 I choked back emotions as I realized that the baby girl I was planning on putting into this very bedroom would all to soon be picking out a formal for the prom. And so, while her brothers are outside playing in the snow I'm going to go have a tea party with my baby girl, while she's still little enough to have tea parties. Ladies, I'm giving you fair warning. What I'm about to share with you WILL change your life. Maybe for the better, maybe not. Did you know that you may possibly be less than five minutes away from chocolate cake at any given moment??? It's true. Simply take 4 tablespoons each of flour and sugar. Stir in 3 tablespoons of cocoa (not hot cocoa mix, but cocoa powder). Add 3 tablespoons of milk, 3 tablespoons of oil and an egg. Stir that all together until it is well blended. Add a handful of chocolate (or whatever) chips and a splash of vanilla. Nuke for 3 minutes. They say to use a coffee mug, but everything I've seen says that it will overflow all over your microwave if you do that. I use my Pampered Chef 4 cup glass measuring cup and it works just fine. If you've got some leftover frosting or cool whip put that on top when it's done. Delicious! Go check on Shannon today. See if she's got anything that will work for you! "I need to make note about 'The wooden rocking chair in the back right corner' of the living room. 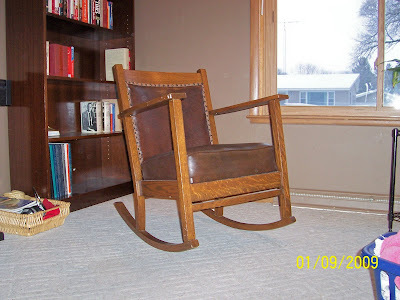 That rocker belonged to your Great Grandpa (Roy) Hatfield. I remember him sitting in it, watching the Friday Night Fights on tv with Dad in the big brick house in Braymer. Your Mom and I were supposed to be asleep in the next room in a double bed with a hand-made feather mattress that Grandma made. There were french doors with glass in them and I could see them sitting out there thru the glass. The rocker is mission style furniture and, if I'm not mistaken, it is made of solid oak. Originally it had horsehair upholstery. Grandpa's nephew Raymond Hatfield recovered it for Grandma years after Grandpa died with whatever's on it now. If I find a picture of Grandma or Grandpa sitting in it, I'll send it to you - even better if one of them is rocking your Mom!" So you have it. The rest of the story. Edited to note: My mom's sister, my Aunt Teresa in Kansas sent me the above email about the chair. I had originally noted this, but blogger went crazy and lost it. Sorry! Well, the time has come! 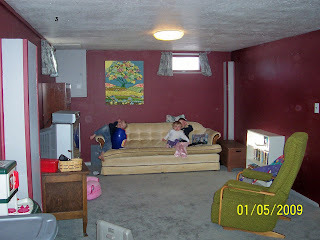 Here are some pictures of our new house. 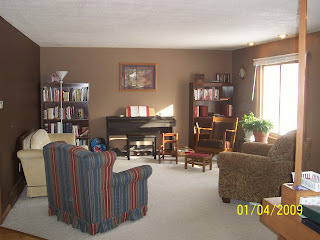 Here's the living room. Note the convenient location of the master bedroom right there behind the white door! Love it. Ah, yes. ..that's more like it! 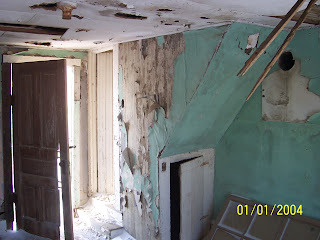 The view of the living room from the dining room. The edge of my built in desk is in the lower right hand corner. The wooden rocking chair in the back right corner was my mom's great uncle's and the little wooden chair in front of it belonged to my mom and her sisters when they were little. The striped chair is on it's way out, we just have to find it a new home. I love the colors, the big picture window and the great natural sunlight streaming in during the afternoons! Here's the dining room shot from the living room. 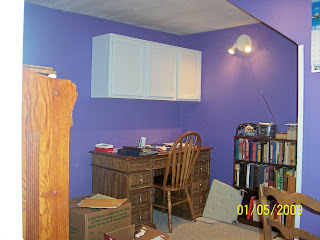 My favorite piece is the cabinet/shelf thinger in the back right corner. We got it for $10 from some friends who moved away. What would you call that thing??? 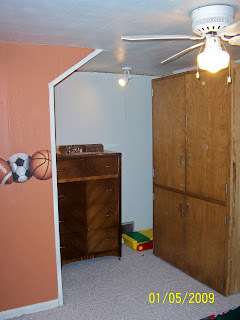 We inherited the big cabinet on the right from the former owner of the house. It's monsterously huge and smells like the fancy candles she used to sell and store in it. And yes, he sleeps on a mattress on the floor. 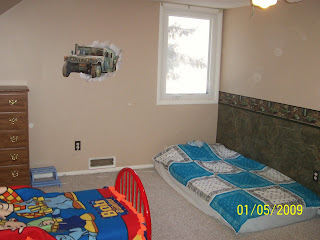 We're looking for great deals on a twin bed for his room. This is only temporary! His room is so tiny, but it's all his and he loves it! 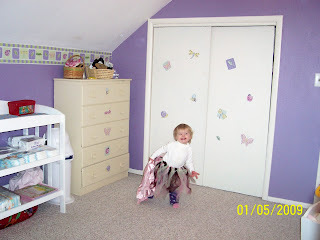 My first attempt at decorating a little girl's room! We did a border with greens, yellows and of course purple in it. It also has little bugs and butterflies. Avery LOVES the "fu-fies". What's a girl room without pink??? Jim found this pink somewhere. 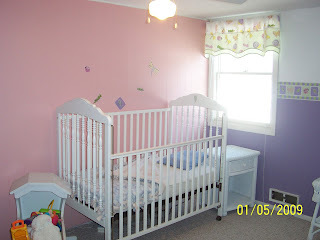 Since it's called "gracious rose" we figured it perfect to put in Avery Rose's bedroom! Across the hall is Aidan and Toby's shared room. 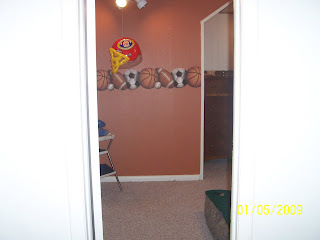 Toby wanted baseballs in his room. Tater wanted camo. I think we reached a good compromise! 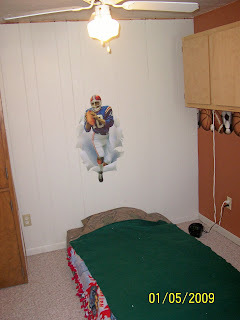 Former owner also had uppercase living sticker phrases all over the house. 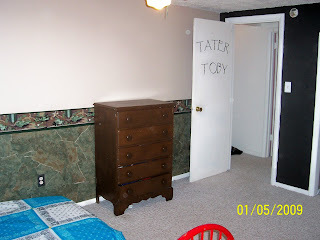 I rearranged some of the letters to form Tater and Toby's names on their door! I'd also like to focus your attention on the killer wallpaper border and fancy wallpaper faux stuff! Thank you. Thankyouverymuch! This house tour has dragged on long enough I think (or maybe it just seems like it since I've overloaded you on pictures). We'll take one more quick stop off in the basement but only because I have to show you something awesome! First, the boring...movie room. The living room is upstairs, so we just call this little nook the movie room. And you'll note the hams on the couch! I have no idea what that gray pillar thing on the left is either. And now the moment you've all been waiting for...drumroll please! Jim and I built that shelf with our own two hands and dang it, I'm proud of it! It makes me smile everytime I see it! 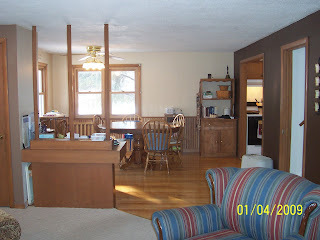 The funny gray pillar thing is off screen to the right of the kitchen thinger. 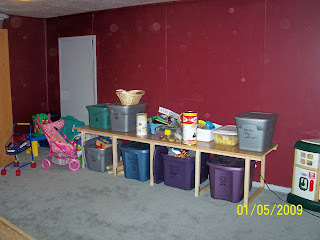 But look, toys, and they're organized and in labeled bins and everything!!! Yes. 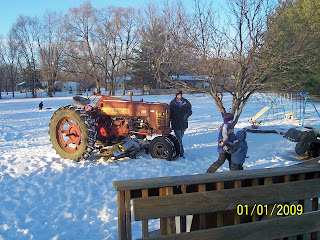 We brought the tractor with us. And yes, the whole expanse of what you see in the picture is ours. All the way back to the trees! And that, my dear readers, works for me. :) Shannon's got lots of other ideas over at her blog. 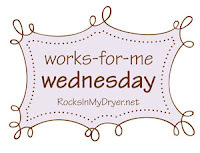 Head over there and see if you can find something that works for you! This weekend marked a significant milestone in our parenting. When we were discussing parenting children we decided that Jim would be responsible for the primary birds and bees lesson for the boys and I would appropriately educate any girls we had. And Evan James was born. And Aidan Michael was born. And Tobias Andrew was born. And I was feeling like I may just be able to slide through life without giving THE TALK to anyone when Avery Rose was born. Oh well, close call. So, Evan had started asking questions and we had started dancing around THE actual TALK and until yesterday that plan worked out pretty well for us. However, we decided that whatever information Evan thought he had was likely flawed and that we should just bite the bullet and set him straight. I was just getting into a nap after lunch clean up yesterday when Jim whomped me on the leg. "Where's that book we have with the illustrations of the human body?" "Huh? It should be on the shelf, if it's not there I have no idea." "Great, thanks. I'm teaching Evan about s @ x today." So much for that nap! So, I putter around desperately wishing I were a fly on the wall listening to that conversation. I understood, however, that manly things were happening upstairs in Evan's bedroom and I knew I had to let them happen. Bottom line, Evan had no idea that Daddies had to take part in the actual conception of a baby. And he was appropriately disgusted at the thought of the actual act of conception of a baby. So, now we have an appropriately educated eight year old with enough knowledge to be dangerous and STRICT instructions to keep his knowledge to himself! Jim's take on the conversation is on his blog. He tells it better than I can. "Mom, when R's dad dies I'll be his dad." Toby and I had a lengthy discussion this evening about his Sunday School teachers' family. The end result? When Mr. SS Teacher dies, Toby will fill in as Mrs. SS Teacher's husband so those kids will have a daddy. I think it is important to note here that R is currently older than Toby (who is currently 3) and Mr. and Mrs. Sunday School Teachers are my age! Toby was very somber and serious throughout the entire discussion and man oh man did I do my best to seriously listen and converse about this topic! So, overall we're having some great conversations here in Tara's World! And we're trying our darndest to keep a straight face through most of them.